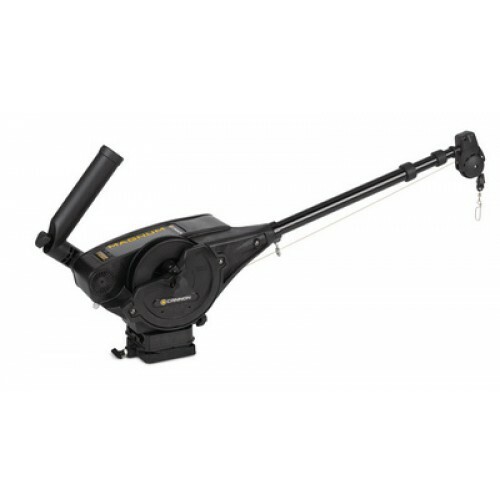 The Mag 10 STX features the fastest retrieval rate on the market (250 feet per minute) and a Short-Stop feature that protects the boat from swinging weight. Includes mounting base, low-profile swivel base, and a telescopic stainless steel boom that extends from 24" to 53". Magnum is built tougher and smarter to make you a better angler. Cannon Edge Design features fewer moving parts, one-piece composite construction, a redesigned boom end, protected circuit boards, and easy access to the spool, switches, plugs and mounting knobs. Telescopic stainless steel boom extends from 24" to 53"